This is an unbelievably stylish laptop from HP! This Star Wars Special Edition laptop is one of a kind in will certainly not be around for very long. Any fan of this mega popular franchise would be thrilled to own this incredible laptop. There are also many hardware configuration options available to meet each users demands. HP Star Wars Special Edition 15-an050nr 15.6 Inch Laptop is the company’s Galactic Empire inspired design laptop, with access to a large collection of never-before-seen Star Wars content for the die-hard Star Wars fans. Here’s some specifications about this laptop you should take into consideration. HP’s Star Wars Special Edition laptop has an Intel Core i5-6200U Dual-Core Processor, with a processor speed of 2.30 GHz, 6 GB of Ram and 1 TB of Hard Drive free space. It comes with Microsoft Windows 10 64-bit edition installed, which allows you to go about using your laptop to complete any tasks you want. The laptop’s measurements are 10.28 inches length, 15.14 inches width and 0.99 inches height, and at a weight of only 5.07 pounds, it makes it very convenient to carry around. The screen is 15.6 inches size, with an astounding Full HD BrightView IPS Display, LED Backlight and a 1920x1080p high definition resolution, allowing you to enjoy films or tv shows at a very high quality image. It comes equipped with an Intel HD Graphics 520 card, a SuperMulti DVD Burner, a Multi-in-1 Card Reader, an HDMI slot, a headphone jack, and 2 USB slots working at 2.0 and 3.0 speed. The laptop also has a built in webcam installed so you can take selfies to share with your social media acquaintances or video chat with friends and family. The Star Wars Special Edition laptop’s desktop has an Imperial Icon installed, where you can launch the Star Wars Command Center quickly to access theme settings, content galleries and even select Star Wars sound schemes for your Windows notifications. Also, you can choose from a gallery of rare screen savers, wallpapers, original Star Wars trilogy archives storyboards and concept art. Moreover, Star Wars special fonts come installed in the font library, as well as Star Wars comic series, movie trailers and e-book passages from the Star Wars universe. The keyboard also has a red backlight that adheres to the theme of the laptop resembling Darth Vader’s or other Sith Lords light saver as well. 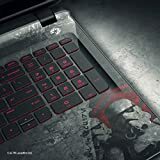 Users are extremely happy with the Star Wars’s laptop design, they often praise the design of the laptop, with its Galactic empire worn out look and feel. They also praise the laptop’s easy set up, as well as the fact that they are able to access extensive content from the movie and set up Star Wars sounds and screen savers at their preference. Reviewers are not so happy with the Lithium Ion Battery, because they feel it does not have enough battery life, but this does not deter from their general liking of the laptop. If you are a star wars fan, then this laptop is probably the one you have been expecting for a long time. Find out more about HP Star Wars Special Edition 15-an050nr 15.6-Inch Laptop here.